This weekend our 'newbie' Rodger Bowen reaches something of a milestone in his (short) triathlon career - the point at which I guess we can't call him 'newbie' any more! Having conquered the Super Sprint distance at the Leukaemia and Lymphoma Research Blenheim Palace Triathlon in early June (read his report HERE), Rodger has decided to bypass the Sprint Distance and at the weekend's Virgin Active London Triathlon (VALT) he will by racing over the Olympic Distance. He should be well prepared though - having initially sent him off to a VALT training day, his next piece of preparation was the Skechers Run session before combining cycling, running (and music...) at the Bose Brick session. The final piece of his fast-track to triathlon success (or exhaustion) was a Core Training session hosted by VALT nutrition partners Maxifuel, where Rodger met the rather swift Emma Pallant, got educated on nutrition and found his core worked rather harder than expected. If you've glanced the triathlon wires of late you may have noticed a relative newcomer to the sport is causing a bit of a stir in the elite racing scene. Emma Pallant took first place in the British Elite Standard Distance Triathlon Championships at Windsor last month having debuted less than a year ago at the VALT 2012. That's pretty bloody great if you want my opinion. 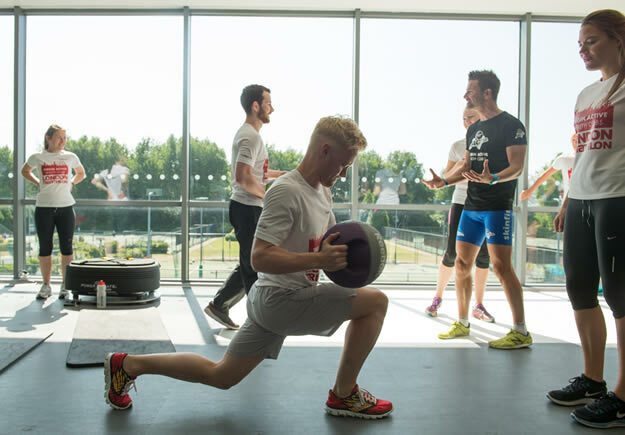 I was lucky enough to be invited along to Virgin Active Chiswick Riverside for a core training session with Emma, lead by Stuart and Matt of Team Freespeed and hosted by Maxifuel. The day started with a presentation by Maxifuel nutritionist Eric Johnstone; he took us through the various nutritional stages of a Sprint or Olympic distance triathlon. In a nutshell... Leading up to the event eat normally and drink plenty of water. Continue eating the same amount even after you have begun your training taper; some people eat more! Don't take on too much fibre on the race-day morning and favour frequent small meals over a single large meal. Have a gel or energy drink a couple of minutes before you get in the water. Once the race has started the best times to take on energy gels will be one in each of the first, second and third quarters of the bike section, one in transition two and one last one halfway through the run if you're flagging. Drink small amounts of water frequently throughout the bike section and transition two; it's good practice to replenish your electrolyte/magnesium levels with tablets you add to water. Lastly, take water from the drinking stations along the run. As with training take on carbs and protein an hour or so after the race for your recovery. Phew! Have a look at maxifuel.com for advice and products you can use to supplement your diet for training and racing. Above all else, don't over-think nutrition! With VALT 2013 just around the corner it might be a little late to build up some race-spec abs but its good to know (better late than never), that core strength provides the foundation of good swimming, cycling and running. The likes of Emma will know the full benefits of having core body strength that essentially does the work for you when you're out training or racing. It is arguably as essential as the interval and endurance training for swim/bike/run. Stuart and Matt introduced the group to some key core exercises. We started with some easy stuff like the “abdominal press” where you lie on your back, push your pelvis into the air and hold it there for a few seconds. The “single leg abdominal press” was much the same. Then “segmental rotation” lying down with knees up again, keeping your shoulders back you roll your knees from left to right. After “standing knee raises” I was starting to think this was going to be the easiest training session I'd ever done. Whenever else do you get to lie down so much? Lulled into a false sense of security I hadn't really prepared myself for “opposite-raiser superman” where you lie on your front and raise one arm out in front of you and the opposite leg behind. Then there was “lunge and twist with weights” which was fine on the first lunge but nigh-on impossible by the time you got to five. Then it got ridiculous. I can't find the name but essentially you lie face up with your shoulders back and extend one leg out as you tuck one leg in whilst simultaneously moving your extended arms forward and back as if you were the puppeteer of your own legs. If you think it's hard to visualise you should try doing it! Then there was another one which involved balancing on a foam roller which I nearly managed to do once or twice. Finally it was death by “bicycle pausers” for me. Emma was kind enough to give me a few tips on how to do some of the exercises properly. It's quite important to activate the right muscles for these things since you don't want other muscles to compensate and hinder your training. All in all it had been a very enlightening session; I discovered I could now ache in some new muscles I previously wasn't aware of. Just another day at the office I guess! In fairness I am very interested in seeing how this will affect my swim/bike/run and at this late hour I'll be finding out on the race-day itself. I'd like to wish everyone racing at the Virgin Active London Triathlon 2013 the very best of luck and I hope to see you there. And so it all begins.. The Virgin Active London Triathlon: race day!